Big Band Holidays Jazz at Lincoln Center with Wynton Marsalis was a great performance including a variety of festive classics, and it allowed me to escape, if only for an hour and twenty minutes, the stress of end-of-semester reality. From the very first tune, which was “Jingle Bells,” the ensemble established a high standard. Various members soloed during that first piece, and audience members applauded and cheered after each, as is traditional for jazz. One of the first soloists was Wynton Marsalis, and I have to say that his prowess on trumpet is clear in even just a few measures of improvisation. At one point during the concert, he played for an extended period in a range so high that I was sure he could break glass with his trumpet. And yet, for the majority of the concert, he was the modest MC of the night, announcing the program and various humorous anecdotes from the stage, playing trumpet in the back row, and applauding his colleagues. My favorite song of the entire night, however, was Jazz at Lincoln Center’s incredible rendition of “Christmas Time is Here.” Joined by exceptional vocalist Veronica Swift, it was cool and quiet, in contrast to most of the other pieces performed, and it seemed to capture the mood of this time of year. Ms. Swift’s voice was smooth and warm and for the duration of the song, it drew me in and transported me to a place of holiday cheer and happy memories. The tune conjured simultaneous images of Snoopy skating among the snowflakes, cozy nights spent in the glow of a Christmas tree, and cheerful times with family and friends. I did not want the song to ever end! The only letdown of the entire night was the fact that the audience did not call for an encore. I was surprised when the audience, which had been enthusiastic and engaged for the span of the concert, collectively got up, put their coats on, and left at the conclusion of the final piece. 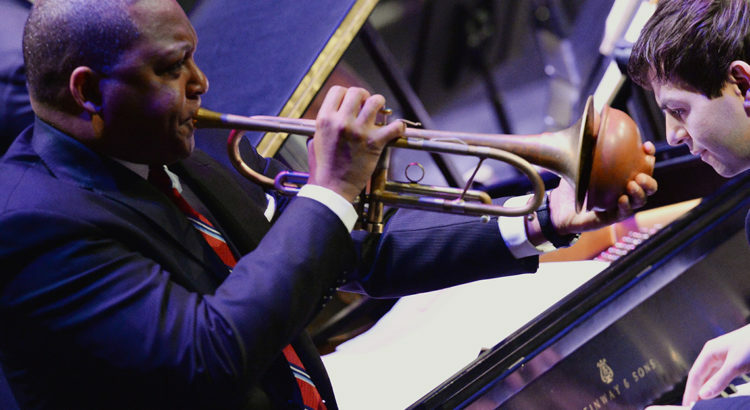 I, for one, certainly would have loved to have the privilege of hearing another song performed by Jazz at Lincoln Center with Wynton Marsalis! Great review!I’m a huge jazz fan, not so much Christmas music fan, but it seemed like an awesome show.